Dan Rothman, the chief technology officer for the city of Boston, gave a tour of one set of the city&apos;s servers in the basement of City Hall. 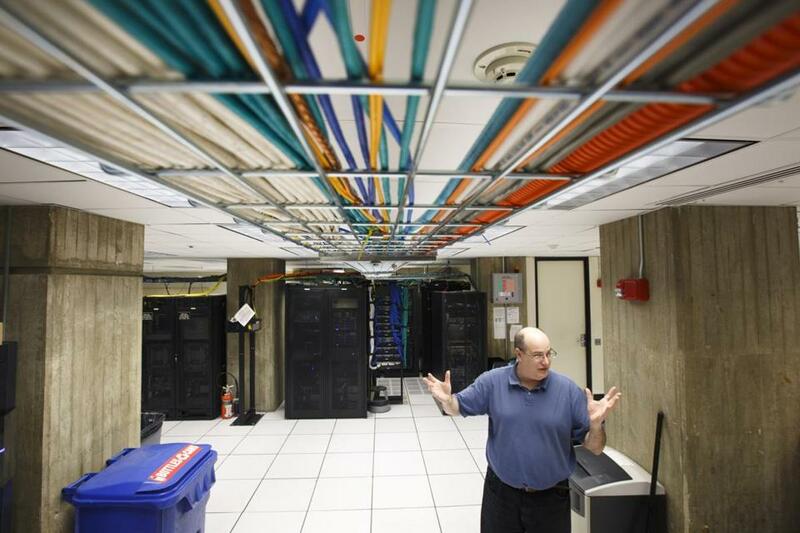 Banks of backup servers and computers that store vital city data remain in the basement of Boston City Hall, 5 feet below sea level and some 50 feet from the city’s original shoreline. On Beacon Hill, legislation to prepare Massachusetts for sea levels projected to rise as much as 6½ feet by the end of the century has not passed. The state’s building code is outdated, as well. Three years after the region narrowly escaped catastrophic flooding from Hurricane Sandy, the city and state remain vulnerable to the kind of devastation that left 159 Americans dead and $67 billion in damage when the massive storm barreled into the Northeast in the fall of 2012, environmental advocates say. City and state officials, as well as utility company officials, insist they have taken some steps to prepare for a catastrophic flood, but environmental advocates say they have failed to take sufficient action. Clarke and other advocates have urged state lawmakers to pass a bill to help the region prepare for greater flooding, noting that 85 percent of state residents live within 50 miles of the coast. The so-called adaptation bill, which failed to win approval on Beacon Hill before the Legislature recessed this month, would also identify the state’s vulnerabilities and establish a program to buy coastal properties that have been repeatedly damaged by storms. The advocates have also criticized the Baker administration for leaving vacant the position of climate change policy director since taking office last January. “As a state, we do not have a comprehensive plan for how to deal with a changing climate,” said Erica Mattison, legislative director of the Environmental League of Massachusetts. Officials in the state Executive Office of Energy and Environmental Affairs declined to comment on whether the governor would support such a bill. They also said they’re interviewing candidates to oversee climate change policy; in the meantime, the position’s duties have been handled by another official. State officials added that they have allotted more than $30 million to repair the state’s dams and sea walls, reduce coastal erosion by shoring up dunes and beaches, and invest in the modeling of how potential floods would affect major tunnels and other infrastructure. A Department of Transportation study, for example, found that the potential for flooding of Central Artery tunnels is likely to triple by 2030 and then more than double again by the end of the century. They also said they’re reviewing the state’s building code. A draft of the revised code, they said, would require new or “substantially renovated” buildings in flood zones designated by the Federal Emergency Management Agency to be elevated 2 feet above likely flood levels. “Climate change is one of the most challenging issues facing the Commonwealth, and the Baker-Polito administration continues to ensure Massachusetts leads the nation in addressing this issue,” said Matthew Beaton, secretary of the Executive Office of Energy and Environmental Affairs. Environmental advocates, however, say the state needs to do more to coordinate efforts with a range of agencies, and they cite the proposed changes in the building code as an example of the inadequacy of the state’s efforts. The code should address the need to prepare existing buildings for climate change, they say, and it shouldn’t rely on FEMA flood maps, which don’t take into account the projections for sea level rise. Swett and other advocates also raised questions about the region’s emergency management preparations. 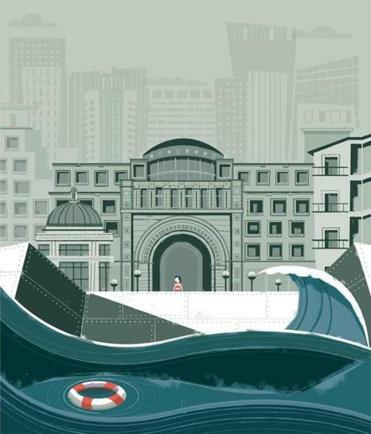 In Boston, they noted, some evacuation routes run through flood zones and nearly half of the city’s 53 emergency shelters are also in parts of the city likely to be inundated during a severe storm. The potential shortfall of shelter space could also be a problem, as the city now plans to house only about 6,700 people, or 1 percent of the city’s population, in the event of a natural disaster. The rest would be expected to stay with friends and family elsewhere. City officials are updating the city’s emergency plans after learning lessons from Hurricane Sandy, which destroyed some 650,000 homes along the East Coast and left 8.5 million people without power. They say they’re reviewing evacuation routes and where shelters are located, while ensuring that the city stockpiles medication and provides space for pets. One lesson they learned from previous storms is that some residents are reluctant to leave their homes if it requires abandoning their pets. Since Sandy, the city has purchased new power generators and has signed contracts to bring in more quickly, if needed. Officials have also made plans to transfer patients from long-term care centers in flood zones to those on dry ground. “I think we’re doing everything we can right now,” said Rene Fielding, director of the mayor’s office of emergency management. Officials from the Boston Public Health Commission said they have participated in several exercises with hospitals since Sandy to test evacuation plans. They have also sought to improve their ability to communicate with hospitals and coordinate care. Officials at Eversource and National Grid, which provide energy to much of the region, said they have also taken action to make their systems more resilient and to improve how they get their message out about power outages and repairs. In the Seaport district in Boston, with Sandy in mind, Eversource is elevating its newest substation on piers. The company has spent $20 million on project allowing it to operate equipment remotely and reroute power automatically. “As technology advances, so does our ability to restore power to large numbers of customers all at once, during and after a storm,” said Michael Durand, an Eversource spokesman. Boston officials are also looking at the possibility of building so-called microgrids around the city that would provide backup power in the event that utility lines from the region’s grid are damaged. In the basement of City Hall, where a burst pipe flooded the windowless rooms with thousands of gallons of water in 1992, refrigerator-sized cabinets filled with the backup servers and computers still hum with data for public health, emergency medical services, taxes, payrolls, and other city services, while other systems on the bottom floor continue to heat the sprawling building. City officials said they’re working as quickly as they can to move the remaining servers and equipment to safer ground. They’ve already spent $575,000 to move most of the city’s primary data storage to a more secure, elevated building in the Financial District. And they’re now looking for space well outside the city to move the rest of the equipment.